With all the various kinds of advice out there for business owners, it gets easy to become lost in all the conflicting and contradicting chatter. What we’re trying to do here is comb through all this information to find the advice that appears most often and seems most useful. There’s a reason why the same advice keeps rising over and over again, and it’s because it didn’t just work once, but worked over and over again for a wide variety of people in a vast array of fields. Whether you’re just starting out or a few years in, this should help keep you going. 1. Do what you love to do. Find your true passion in life and build upon it. The only way to do truly great work is to do something that you love. Since your work is going to fill up so much of your life, you should make it something that you want to do, something that you enjoy. If you don’t know what that is yet, keep looking. You’ll find it. Don’t settle for something you can just do well. If your heart’s not in it, your head won’t get in there either, and you need both to succeed. So keep looking because you’ll know when you find it. Even though it may be hard at first, keep going. Like all great relationships, it gets better with every day. Have your hand in every element of your company. It’s important to delegate tasks, but don’t delegate yourself out of the loop. You need to be involved in every level and step of your company in order to know what your company is doing and how it’s working. This will also improve the team you’ve assembled. Never believe a job you’ve created is beneath you, and be sure to know what your employees are doing and how they’re performing. Discover the challenges at every level of your business and work with your employees and colleagues to work through them. You’re going to fail. Not only will you fail one time, you’ll fail often. Failure breeds success for those willing to learn and put in the work to get past them. If you haven’t failed at something, than you’ve never risked anything, and if you’ve never risked anything, you’ll never find real success. Playing it safe may keep you in business but it won’t get you where you want to be, and it won’t make your company what you want it to be. Learn from your customers and competitors. Learn from your colleagues and employees. Always be learning and always be striving to improve. Look past the immediate failures and setbacks and see the opportunity there. If a product or service isn’t working, that gives you an opportunity to re-evaluate and re-design. When someone has an idea, whether it be a family member, a friend, a colleague, or an employee, capitalise on it. Don’t let the opportunities and ideas rest or go ignored because they didn’t originate with you. When a customer complains, take it as a moment to learn, as a new opportunity for improving your product or service. Running a business is stressful, regardless of size, and some of the most stressful moments come from being small. You’ll run into a thousand challenges while working your way towards sustainability and success, and you can’t let it overwhelm and destroy you. Trust your vision and be patient. Surround yourself with capable people who work hard and believe in your vision. Take challenges as they come and deal with them one at a time. Success takes time and you need to make every moment count. The best way to keep the stress at bay is to keep working and pushing and working towards your vision. These all sound simple but they’re not easy to make reality. The simpler something seems usually relates to how difficult it is to achieve, but success isn’t easy. Most businesses fail for a number of reasons, but if you can keep these five things in mind, you’ll be a step ahead. Spreading Joy: Overall company happiness has to begin with a fundamental company culture of spreading joy to consumers and the public. Impacting Positively: Being a beneficial force in the world will lead to happier workers that are proud of their company. Respecting Talent: Take advantage of the talents and skills of your workers and utilize them to their full potential. Building Connections: Work should be an opportunity to create friendships and connections with like-minded people, and that bond will result in collaboration, productivity, and innovation. Being Rewarded: Money isn’t the only way to reward workers for their performance; emotional or creative compensation can be a powerful way to strengthen employee loyalty. Staying Grounded: A company must pay attention to the interests and desires of their customers, employees, and community, in order to fit in, yet still stand out. Serving Others: Innovative customer service shows consumers that you care and employees that you trust them. Leading Wisely: Leaders need to epitomize the company culture in every way, leading by example to inspire loyalty and progress. Maximizing Resources: Be sure to provide all the necessary tools, both physical, motivational, and intellectual, which are needed for employees to be successful. Making Money: There is nothing wrong with being profitable, particularly if you boost the trust of your shareholders and use your success to develop long-term goals. Balancing Time: Perfecting a healthy balance between the professional and personal spheres is essential for a happy company. Improving Reputation: When the people of the world know your name, be sure that they have good things to say about it. Thinking Creatively: Abandon old ways of thinking and let the natural creativity and innovation within your company drive you forward. Feeling Valued: Workers are invested, involved, and irreplaceable components of any company; reward them accordingly. 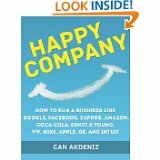 Although Happy Company sounds like a title geared toward CEOs who are interested in creating a happy company, it actually teaches a lot about happiness in general. The key to creating a happy company is creating a culture of happiness – which is something everyone could use in their lives. The child remains wide-eyed throughout life. He sees the world as a series of challenges waiting to be accepted and conquered. Optimism is his weapon of choice and his belief in himself, in the world push him past the limitations others see. Where some see an ocean, he sees a big lake waiting to be crossed. Where some see giants, he sees people to grow past. When people tell him that something’s impossible, he only nods and thinks, Not for me. This wide-eyed boy becomes a wide-eyed man who builds past what everyone thought possible. This wide-eyed man is Sergey Brin, the co-founder of Google, the most popular search engine. Google has been so successful, it’s difficult to remember the internet before Google. It’s difficult to imagine what the internet would be like now had Google never existed. From its humble beginnings in his dorm room to a few servers in a garage and eventually into the massive technology giant it is now, it’s hard to measure that transformation. Brin has been compared to Johannes Gutenberg, the inventor of the printing press. While certainly different, Brin’s accomplishments are certainly nearing as great. Google has changed the internet, which, in turn, has changed the world. While Brin has a lot of advice for small businesses, these are just a handful of quotes from his brilliant mind. The way hardware and software evolve and change, anyone and everyone has the ability to scale up anything. This gives everyone a massive amount of power and all the tools necessary to succeed. Technology has caused an equalising effect on the future. Your education and pedigree will no longer give you an inherent advantage or disadvantage. A poor urban kid with a computer can do anything a rich suburban kid can do with a computer, even start their own business or discover new ways to design and make products. Brin’s optimism gave him an advantage over his peers. He never let the seeming impossibility of a task hold him back. Rather, he pushed through them. Everything that discouraged 9,999 people became a challenge for him to move past. When people said he couldn’t, he proved them wrong. He didn’t see the future or his limited resource as a crippling limitation. He saw them as opportunities to keep progressing forward. Google started very small, but when it began rising, it never stopped. Brin wasn’t afraid to lose his small business feel or to venture from small business into international corporation. Rather, he used this growth to his advantage and built upon prior success, and allowed the growth to make Google the most important search engine on the internet. Brin wasn’t afraid, and he trusted his vision and his employees to keep improving it. This sounds counter-intuitive but that doesn’t make it any less true. The big problems can be handled, but the little ones can take a lot of time and energy to work out. This is where the importance of your employees and team come in. Trust them to get the details, to figure out how the product or service works. The big problems, like getting the service to people, is much easier to do than making sure the product or service does exactly what it’s supposed to do. Ensure you can work out the details, and be flexible with them. Always stress how important your employees are. The best business plan, service, and products can’t save you if your staff doesn’t work. When hiring, don’t only go for the most qualified. Go for those who think outside the box, those who can collaborate and thrive in that environment. Find people excited about what you’re doing. Let them help you get to where you want to go. You’re going to be trusting your employees with your company, so make sure you believe in them and trust them. If you don’t, then keep looking for the right people, even if it takes a thousand interviews. Sergey Brin is a man who knows success and Google is arguably one of the most important companies in the world right now. That alone should make Brin’s advice carry some serious weight. It’s the strange ones, the people who color outside the lines, who walk unfamiliar paths who change the world. Find yourself out there in the wilderness wandering and bring that love and excitement back to the world. Share it. Take your insight and enthusiasm and give share it with the world. If you’re going to take the risks no one else took, if you’re going to live the life no one else lived, you may as well tell the world the lessons you learned from living on the edge. Be daring, and be open to the possibilities of the world and you’ll find yourself in the middle of an extraordinary life. Elon Musk, founder of SpaceX, Tesla Motors, and PayPal is one such person. Born in South Africa, he began a journey to become a US Citizen at the age of seventeen. He gave up on his PhD studies in physics to pursue his interests in the internet, renewable energy, and space. He founded PayPal, which grew enormously and continues to be one of the most used web-based financial tools in the world. He sold it to begin SpaceX, which specialises in space exploration. From there, he began Tesla Motors, SolarCity, and Hyperloop. Musk is a man who doesn’t easily fit into any model for what an entrepreneur or CEO should be, but his drive and determination makes him a constant success. Here are some of his most useful pieces of advice. 1. Get as much feedback and advice as you can. It doesn’t matter what your idea is: get advice and get critical feedback. You may have to draw this feedback out of them, but it’s the most important to get. Ask them what’s wrong and listen to what they say. They’ll help you discover the quality of your idea, and also the holes in it. By listening and asking for help, you’ll learn a lot about what your goal actually is and how to get there. Though Musk started Tesla and SpaceX simultaneously, he strongly recommends against doing it. Throw your time and energy into one project. Work day and night to make it succeed. Seven days a week and no breaks. That’s the kind of dedication it takes to start a company and make it grow into a success. Success isn’t easy and it doesn’t come from just having a great idea or the right amount of investment money. It takes serious work for years. 3. Find a team that works. Make sure everyone understands exactly what the goal is. When brining someone into your company, give them your mission, make them understand it, and make them know that they’ll be a part of reaching that. Keep things clearly defined and understood and let them know that this overall goal is now their goal. That improves their enthusiasm, since you’re finding people who are doing more than just working for a paycheck. They’re working for a company they believe in and are proud to be a member of. On the other side, don’t be afraid to let people go who aren’t willing to be a part of that goal anymore. 4. Things will start hard and get harder before they get better. You’re going to be putting in a lot of work and it’ll be difficult, but you’ll be optimistic and full of energy because you’re making your idea and dream come to life. Though the beginnings are tough, you feel better about them because things are progressing and you’re feeling good. It’s when things begin to go wrong that the real difficulty comes. When you’re into your second or fifth year of the company and you’re still working tirelessly, doing all kinds of chores you’re not interested in but need to be done in order for the company to succeed–that’s where the real difficulty comes. Be prepared to do whatever it takes. You’ll be constantly in danger of the company dying, and if you’re not prepared to do whatever it takes to succeed, then you won’t. Do whatever you can to foster growth. Take chances and bet on yourself, and bet on small companies. Though they’re small and fragile and may not succeed, the rewards are bigger when they do succeed. You’ll be up against giant companies whose lawyers make more than your whole company, and it’ll be up to you to fight back and keep growing. In the face of so much adversity, it won’t be easy, so focus on growing where you can. Elon Musk is a visionary and enormous success. There are few like him, but if you want to try and walk in his shoes, then take his advice. Are you wondering whether you’ll make a good entrepreneur? Or, if you already are an entrepreneur, are you giving some thought to what personal characteristics you should develop in order to help your business thrive? In either case, you’ll find this list immensely helpful. Here are eight traits of successful entrepreneurs. They enjoy what they do. One reason a lot of people choose to become entrepreneurs in the first place is in hope of finding a more enjoyable job. Even if that’s not the primary reason you want to become – or have become – an entrepreneur, it’s incredibly important for success. If you enjoy your work, you will be more passionate, more committed, and more willing to put in extra hours. All of those things are huge factors in determining whether you will ultimately be successful in your endeavor. In fact, this is one of the traits that came up as being most important in a Gallup poll that studied 1,000 successful entrepreneurs. It makes sense that entrepreneurs would be independent – they’ve struck out on their own to do things outside the traditional office environment. Usually, people that even want to become entrepreneurs in the first – whether or not they ultimately make successful entrepreneurs are independent. A good entrepreneur needs to be able to work without taking direction and without relying on others for decision-making. If you are running a home business, it is easy to lose focus or to consider it “not a real job.” You can’t allow yourself to fall into that mentality if you want to be successful. That sort of mentality will allow you to be easily distracted and to allow other things to take priority when you should be working. It will allow you to be swayed by other people who don’t consider your job a real job just because you don’t have set hours or an office. It will allow you to engage in many behaviors that will sabotage your ability to succeed as an entrepreneur. As an entrepreneur, you will encounter a lot of naysayers. You can’t listen to them, though. You will also encounter a lot of failure – all great entrepreneurs have had some pretty significant failures on their journey toward success. Ultimately, though, the reason that they succeeded is because they didn’t give up. They were tenacious. Success often involves a lot of failure. As Jimmy Carter once said, “Go out on a limb. That’s where the fruit is.” In other words, you have to take risks in order to achieve success. When you work in a company, you may not feel that on a personal level the way that you will as an entrepreneur. In a company, when the company takes a risk, if you fail you will all fail together; as an entrepreneur, it’s just you. Knowing that can make it harder to take risks, because you know you’ll be the only one picking up the pieces if things go wrong. Nonetheless, successful entrepreneurs are still able to take risks – and to move on and get past it if they fail. Even if you don’t know a lot about money management going into it, once you become an entrepreneur you will have to get good fast if you want to succeed. A positive cash flow is what keeps any company alive and is a huge part of how we define what makes a company successful. So, in order to be successful as an entrepreneur you have to have a good understanding of the finances of your operation. As an entrepreneur, there won’t be someone else to leave it to – you’ll have to deal with all this yourself. You’ll need to properly allot for expenses, understand how to price your product or service for maximal returns, and understand what you really need and what you don’t. This may all seem obvious, but in fact when people make the decision to become an entrepreneur the lack or presence of money managing skills is not often a deciding factor. Even though many entrepreneurs work from home, they usually still need to have strong people skills. People skills are good for networking, for securing funding, and basic customer service. Even if you sell an online product and never meet your customers face-to-face, you will probably still have to answer questions and possibly deal with issuing refunds to unhappy customers – and both those things require people skills whether you’re doing them online or on the phone. If you handle these things badly, you may end up with a myriad of negative online reviews or Better Business Bureau complaints – outcomes which would undoubtedly have a negative impact on your business. So, even in the scenarios that involve the least significant amount of human interaction, you will still need people skills. There are all sorts of different kinds of creativity. So, even if you’re not an inventor and don’t think of yourself as the person who will introduce a new product to the world, you may still have other kinds of creativity that will help you succeed as an entrepreneur. You might think of different ways to market your product or service or you may have a creative twist on something that already exists. Whatever the case, entrepreneurship presents tons of problems that creativity helps solve in novel ways that can go a long way towards achieving success. Evgeny Plushenko, a Russian figure skater, competed in Sochi at the age of 31. For a singles competitor in figure skating, that’s ancient. He’s the only male to have won four medals in four Olympics. In 2002 he won the Silver in Salt Lake; in 2006 he won the gold in Turin; in 2010 he won the silver in Vancouver; and in 2014 he won a gold in the new team figure skating event. Although he ultimately withdrew from Sochi, he’s still talking about sticking around for the 2018 Olympics. If you apply this sort of belief that you’re never too old to your business or career, you might give yourself the courage to reinvent your career at any age. #SochiProblems became a famous – or infamous hashtag due to the fact that Sochi was embarrassingly underprepared for the games. Some of the hotel rooms weren’t finished, stray dogs wandered the streets, and the streets weren’t even done being paved by the time the Olympics started. Of course, because it was the Olympics, it’s not as if Sochi has to worry about losing business to a competitor; there isn’t an alternate Olympics in Moscow. If any business were this miserably unprepared, it would fold pretty quickly. Instead, Sochi had just gotten a lot of negative press. As a result of the miserable preparations mentioned above, the doors in some of the hotel rooms didn’t function properly. In one notorious case, American bobsledder Johnny Quinn got locked inside the bathroom of his hotel room. Amazingly, he kicked through the door and immediately posted images of his “Sochi jail break” online. A lesser person may have just given up, but Quinn wasn’t about to miss out on the chance of a lifetime, so he kicked his way out. Success is all in how you view it. Technically, this isn’t “new” Olympics news; this is based on a mid-1990’s psychology paper published by the American Psychological Association. In it, Victoria Husted Medvec, Scott Madey, and Thomas Gilovich determined that bronze medalists were often significantly happier than silver medalists. Why? Because bronze medalists viewed their alternate outcome as not medaling at all, whereas silver medalists viewed their alternate outcome as winning first. Thus, although the silver medalists clearly placed higher, they were less satisfied with the results. Starting a new business is daunting and, like all things, the hardest part is starting. But every successful company you’ve ever heard of had to start somewhere. Though there are a lot of reasons why they’re successful, there are a few basic ideas that frequently come up. 1. Ideas come from everywhere. Don’t be selfish or too proud. A good idea is a good idea, and it doesn’t matter if it came from your babysitter or waitress. There’s a general belief that all great ideas come from the top of the company. And while that may have been true with people like Steve Jobs, most of us are not Steve Jobs and will never even be remotely like him. Ideas come from all over, and you need to decide which ones to follow. 2. If you want to do something, do it. If you want program new software or hardware, the best way to prepare for that is to do it. If you want to be a programmer, start programming. Learn how top do what you want and then make it happen. A football player doesn’t simply start playing football at the professional level. What you’re seeing when you watch professional sports is the culmination of decades of work at those specific skills. The same is true for artists and musicians, and so the same applies to business. The best way to do something is to just get out and do it. Now, this is why it’s also important to do something you love. Since you’re devoting so much time to a specific set of skills, it better be something you love doing. Save your money and put it back into your company. Vacations, big houses, and fancy cars are nice, and they may show that you’ve hit a level of success, but they don’t keep you there. Rather than buy that new Mercedes, push that money back into your company, into your ideas, and see where it leads. If you can make all that money starting from nothing, how much more can you make with the profits? Re-invest in your company and watch the returns grow higher and higher. 4. Intellectual property isn’t as valuable as you think. You may have the best idea that’s ever happened in your industry, but if you’re not continually pushing past it, making it better, making it more, than you don’t have much. The better your initial idea, the quicker it’s going to be copied and innovated to something better, so you need to stay ahead of your competition. By the time they catch up to your initial good idea, you should be at least one innovation past them. So while that first idea is extremely important and it will get you started, it’s still just one idea, and if you only have one idea then you’ll never really succeed. 5. Innovate but remain accessible. With every idea you need to keep the customer in mind. If you innovate too much and become too complex, you’ll lose those supporters who made you who you are. Keep your product and services simple for the customer. The customer is everything when you’re starting up, especially now with sites like Yelp so readily available. If you don’t treat your customers well or don’t give them a satisfactory experience, you may lose way more than that one single customer. A bad review spreads fast now, so you need to innovate to the needs of your customer. Give them what they want and they’ll keep coming back. Starting a business isn’t easy and it gets more difficult the deeper you go. But before you can meet all those later challenges, you need to rise above the initial one. Have a great idea that’s great for customers. Trust your vision and re-invest in yourself. Keep your eyes and ears and mind open to new ideas and be ready to make them into something great when opportunity arises. There’s no place for pride in business. I’ve never been in prison, but like everybody else these days, I’ve seen plenty about it on TV. Ever since Orange is the New Black became a Netflix sensation, prison-related shows and books have been all the rage – and of course there are the old standby prison documentaries on MSNBC. As fascinating as it is to learn about the bizarre and terrifying world of prison, there are actually some very useful business lessons that can be gleaned from the world behind bars. In Orange is the New Black the main character, Piper, comments on how bad the prison food is – in front of the cook. As a result, the inmates who work in the kitchen conspire to starve her for a week. We’ve probably all, at one time or another, accidentally said something embarrassing or put our foot in our mouth because we didn’t know who we were talking to. Although the immediate consequences of that can be more dramatic in prison, in the business world, the consequences of such a faux-pas can be just as real. The inmates who are capable of being the least miserable in prison – Alex, Nicky, even Piper at times – are all flexible and able to adjust to a rapidly changing environment. However, Pennsatucky – who is pretty much the epitome of inflexible – is always unhappy, always scheming, and nearly gets killed at one point. Piper suspects that Alex is the one who testified against her and thus landed her in prison. Nonetheless, Alex tries again and again to get Piper to speak to her – and eventually the persistence pays off. Partway through the first season, Piper and Alex begin speaking again – and eventually they end up sleeping together again. Although obviously you shouldn’t be trying to sleep with anyone at work, persistence still pays when it comes to promotions and new assignments. Don’t let you anger get the better of you. Piper completely flips out at one of the guards while she’s in solitary – and later comes to regret it when she realizes that he’s the one who will determine how long she stays there. Another time she goes ballistic on Pennsatucky, beating her senseless. We don’t know what the consequences of that are by the end of the first season, but it’s a pretty good bet that that’s an action that will come back to haunt her. When one of Piper’s cellmates is having a bad day, she tries to strangle a guard. As a result, she gets sent “up the hill” to the maximum security part of the facility, where she’ll have to do the remainder of her sentence. Point is, there are always consequences for giving in to your anger.